The foundations of a small pyramid containing a burial chamber have been found at an ancient cemetery in Abydos, Egypt. Inside the chamber, archaeologists found a finely crafted sarcophagus covered in engravings of Egyptian gods and hieroglyphic inscriptions recording spells that helped one reach the afterlife, as well as more than a dozen human remains. 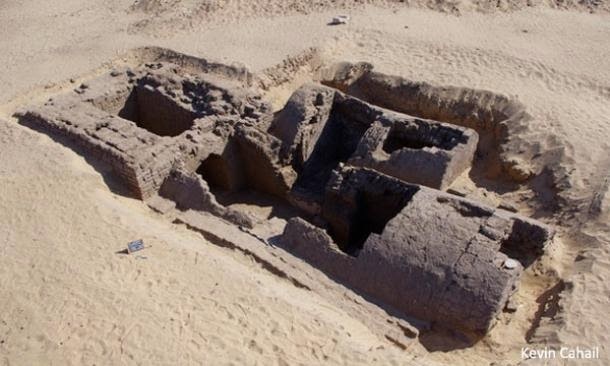 Researchers uncovered a rectangular entrance shaft with massive walls during excavations in the sacred city of Abydos, one of the oldest cities of ancient Egypt and home to many important ancient temples, including Umm el-Qu’ab, a royal necropolis where early pharaohs were entombed. The entrance shaft served as a base for a pyramid that was estimated to have been 7 metres in height. "Originally, all you probably would have seen would have been the pyramid and maybe a little wall around the structure just to enclose everything," said Kevin Cahail, a doctoral student at the University of Pennsylvania, who led excavations at the tomb. 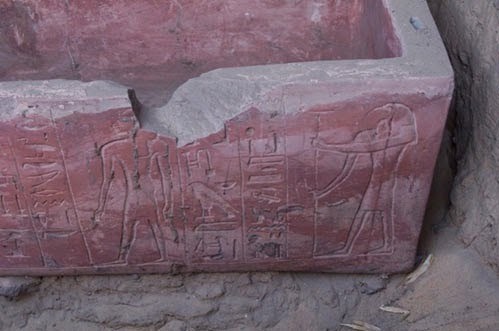 Within one of its vaulted burial chambers, archaeologists found a finely crafted sandstone sarcophagus, which was painted red and carved with images of Egyptian gods. It also contained inscriptions containing spells from the Book of the Dead, an ancient Egyptian funerary text used from the beginning of the New Kingdom (around 1550 BC) to around 50 BC. The text consists of a number of magic spells intended to assist a dead person's journey through the Duat, or underworld, and into the afterlife. The sarcophagus was painted red and contained hieroglyphics. Photo credit: Kevin Cahail The sarcophagus, which had been looted in antiquity and was empty, was created for a scribe named Horemheb. There are also inscriptions referred to Ramesu, Overseer of the Stable, who may have been the father or older brother of Horemheb. Although Horemheb was missing, other human remains survived the ransacking. Archaeologists found the skeletal remains of 3-4 men, 10-12 women, and at least 2 children. The presence of a disproportionate number of females has led archaeologists to speculate that Horemheb and Ramesu may have had multiple wives. Polygamy was a common practice among the pharaohs, but it is uncertain if it was practiced among non-royalty. Another possibility is that the tomb was used for multiple generations of the same family, or was re-used at a later date. Radiocarbon tests, which have not yet been carried out, may help resolve the speculation. 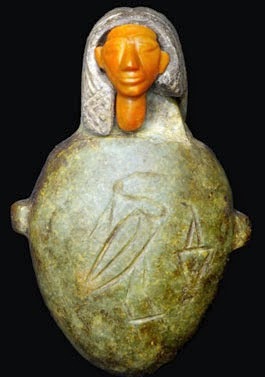 Among the treasures found within the tomb were shabti figurines, funerary figures typically placed in tombs that were intended to act as substitutes for the deceased should he/she be called upon to do manual labour in the afterlife, and a heart amulet made of red and green jasper. The jasper heart amulet. Photo credit: Kevin Cahail "It's a beautiful object and possibly one of the best carved examples of these very rare type of amulets," Cahail said. "It was probably on the chest of one of the deceased individuals and there probably would have been some sort of necklaces and gold and things like that." Cahail explained that the heart-shaped amulet was probably related to spells from the Book of the Dead that tell the heart of the deceased not to lie. The ancient Egyptians believed that, after death, one’s heard and good deeds would be weighed against the measure of truth. If their heart weighed the same or less they could obtain eternal life, but if it weighed more they were destroyed.